Has Charlie taken Mark of the Year? A brilliant first win of the season for the Lions who were more efficient by foot (68 percent to 64 percent), and better at generating forward half intercepts (3021) and scoring from this source (57-26). An excellent stoppage goal for the Lions launched from a clever hitout by Stefan Martin. Brisbane lead 3414 in scores from stoppages. An equal teamhigh nine score involvements now for Dayne Zorko including the last assist on the Rayner goal. Zorko has team-highs for disposals (28) and metres gained (653). The Lions now have a massive 153 advantage in contested marks, and Harris Andrews has taken more such marks (four) than the Hawks. Brisbane has averaged a competition low 17 points from 21 forward half intercepts this season. Today the Lions have scored 8.2. (50) from 26 such intercepts, which is easily their best return in 2018. Tom Mitchell has collected 24 contested possessions (which is double the next best Hawk player), and has gone past 40 disposals for the fifth time this season. A first goal in the AFL for James Worpel is matched by Matt Eagles. The mature age recruit has had seven intercept possessions with the last one leading to the goal. Luke Hodge is averaging careerhighs of seven intercept possessions and five spoils per game this season. Today the former Hawk has matched these numbers with a game-high four intercept marks. In the final quarter, the Lions lead effective kicks (111) and disposals (26-10). Brisbane has now kicked 14 of the last 19 goals. The important first goal of the final quarter was launched from a defensive 50 stoppage clearance by Hugh McCluggage, who has now amassed 11 loose ball gets (no other player on the ground has more than six). In the third quarter, Brisbane won time in forward half (67 percent), forward half intercepts (92), inside 50 entries (18-11) and effective kicks (41-22). A dominant quarter from the Lions who lead 113 in shots at goal but returned a wasteful 4.5. (29) with two misses, to allow the Hawks to stay within 27 points. Brisbane has retained possession from 70 percent of its 33 inside 50 entries, while Hawthorn has retained possession from 50 percent of its 40 forward 50 entries. An excellent long range goal from Jarryd Roughead came from just the fourth forward 50 mark for the Hawks who average 12 such marks per game. Harris Andrews has recorded 12 spoils today which is more than double any other player on the ground. Andrews is averaging careerhighs of 16 disposals, nine spoils and seven intercept possessions per game this season. A crucial final few minutes now, Brisbane has been outscored by average of 15 points during timeon this season (ranked last), while Hawthorn has outscored its opponents by eight points per game during this period (ranked third). Brisbane is winning the territory battle this quarter with 68 percent time in forward half and a 50 advantage in forward half intercepts. Hawks InterchangeJames Cousins and is possibly out for the game. A breakout game today for Hugh McCluggage who has won 12 groundball gets which is double the next best Lion, and has a team-high 23 disposals. Five of the last six goals now to a surging Brisbane, who also lead 2113 in effective kicks this quarter. Brisbane have a gamehigh 18 point lead and an 8-3 advantage in both forward 50 marks and inside 50 entries this quarter. Brisbane currently lead contested marks 82, and intercept marks 11-9. The Lions are ranked last for intercept marks this season. Three goals and one assist now to Jack Gunston who has been the primary target (five occasions) for kicks inside 50 by the Hawks today. 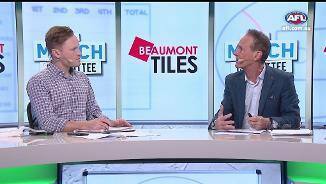 Brisbane was able to score five goals to two in the second quarter despite again conceding an advantage in inside 50 entries (913) and time in forward half (56 percent) to Hawthorn. The Lions have been more efficient with their ball use and scored 6.1. (37) from 17 forward half chains, while the Hawks have scored 3.2. (20) from their 22 forward half chains. While Hawthorn has a 2916 lead in inside 50 entries, the Lions lead 5-3 in forward 50 marks and 21-15 in forward 50 effective disposals. The excellent coastto-coast goal from the Lions was the the first time today they have generated an inside 50 entry from a defensive 50 chain. 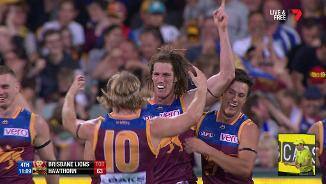 An excellent snap at goal from Cam Rayner makes it eight goals from just 13 inside 50 entries by the Lions. Brisbane averages a goal from 22 percent of its inside 50 entries this season. Ironically the first behind for the Hawks is registered by their reliable goal source in Luke Breust who has recorded 207 scoreboard impact points (scores and assists) this season, which is ranked No.1 in the competition. Hawthorn leads 2016 in first possession wins at stoppages, but Brisbane lead 17-14 in clearances. Both teams have scored two goals from stoppages. Brisbane is relying heavily on forward half chains today with the Rich goal its fourth following a forward half intercept. 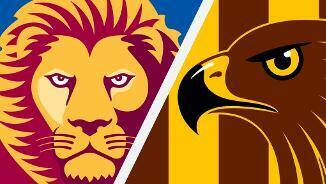 Hawthorn has generated nine inside 50 entries from 19 defensive half chains, compared to Brisbane two entries from 20 such chains. The Sicily goal capped a run of seven consecutive inside 50 entries for the Hawks with Brisbane unable to effectively clear the ball. Brisbane has not been able to generate an inside 50 entry with any of its 16 defensive 50 chains today. Over the past four weeks, the Hawks have scored from only 38 percent of their inside 50 entries (ranked last). They have five scores from 22 entries today. A fast start to the second quarter for the Lions, who lead disposals (214) and have had the first three inside 50 entries to start the quarter. Brisbane has now scored 3.0. (18) from seven forward half intercepts. Hawthorn has scored 2.0. (12) from its nine forward half intercepts. The Hawks have recorded a shot at goal accuracy of 55 percent this season (ranked No.1), and are yet to record a behind today. Hawthorn had ten players record multiple groundball gets in the first quarter led by Tom Mitchell with six. 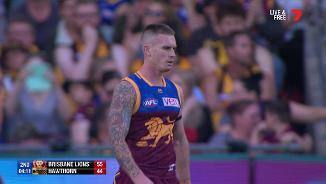 Brisbane only had two such players, with Hugh McCluggage winning six of the Lions 18 ground-ball gets. 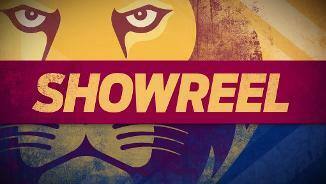 An entertaining first quarter with Brisbane managing to hang with Hawthorn due to some efficient forward half play. The Hawks had a massive advantage in contested possessions (4428) and inside 50 entries (16-7). The Hawks are playing a very high possession style of game today already recording 129 disposals which is well above their season average of 92 disposals per quarter. 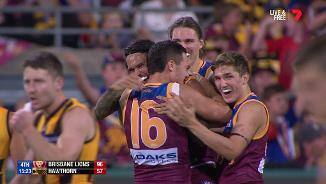 An opportunistic goal from a forward 50 stoppage by Zorko gives the Lions their first lead of the game. Brisbane is ranked third at scoring from stoppages this season with 32 points per game. While Hawthorn leads the tackle count (2011), Brisbane has been able to disrupt some of the Hawk ball movement this quarter with spoils (9-5) and smothers (4-0). Three goals from three inside 50 entries for the Lions, and two goals from two forward half intercepts. Brisbane has scored from only 26 percent of its forward half intercepts this season (ranked last). 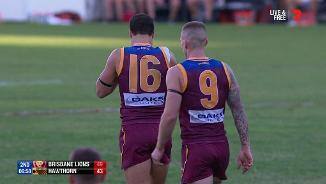 Both of the Brisbane goals have been launched by Hugh McCluggage intercepts, with the last goal coming from the Lions first forward half intercept of the game. Hawthorn currently leads 60 in forward half intercepts and has scored 2.0. (12) from this source and enjoyed 70 percent time in forward half as a result. Hawthorn lead 40 in one-on-one contest wins. Brisbane has been involved in the fewest offensive one-on-one contests this season and have recorded a win rate of only 21 percent in these contests (ranked last). Brisbane are struggling to disrupt the ball movement of Hawthorn (trail in tackles 29) with Isaac Smith making it four goals from seven inside 50 entries. Smith is averaging career-highs for goals (1.5) and kicks (15) this season. Three early goals to the Hawks from six inside 50 entries. The Lions have conceded a score from 48 percent of opposition inside 50 entries this season, which is ranked 16th defensively. The first goal for the Lions was launched by a a defensive 50 intercept from Hugh McCluggage. Brisbane has generated 22 percent of its scores from defensive 50 chains this season (ranked fourth). The Hawks get the opening goal of the game following a forward half intercept. Hawthorn has scored a competition best 39 points per game from its forward half intercepts. Mitch Lewis, who makes his debut for the Hawks today, has averaged three goals, five tackles and eight score involvements in his five VFL games this season. Over the past four weeks, Hawthorn has lost the clearance count by five per game (ranked 15th), while from Rounds 14 they ranked second in this measure. Since 2015, Brisbane has lost the inside 50 count by 16 per game against Hawthorn, which is the worst differential recorded by any team against the Hawks in this period. Welcome to Gabba for the Brisbane Lions v Hawthorn Round 9 clash. 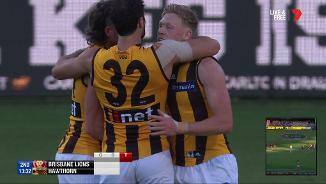 After Hawthorn jumped to an early 18-point lead, Chris Fagan's men first inched their way back and then steamrolled the Hawks with an exhilarating final three terms. 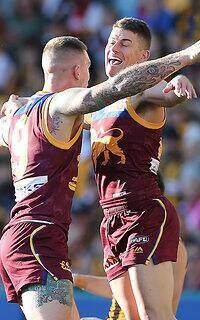 It was the Lions’ first win over Hawthorn since 2009. 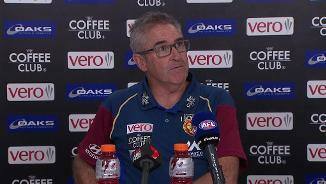 Coach Chris Fagan said after eight straight losses it was the result his team needed. "It's great for our group, it gives them some positive reinforcement for what they've been doing all year," he said. "Tonight we got that bit of nourishment from winning a game of football. "It'll give them a little bit of confidence. "Our pressure was really good and it all changed after quarter-time and it was on the back of that really." 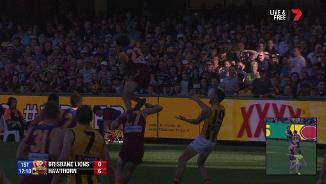 Hawthorn kicked four goals to one before many of the 20,628 fans had taken their seats at the Gabba, but could not capitalise on its first-quarter dominance. The Hawks had 29 inside 50s to the Lions' 16 at the half, yet trailed by 11 points. 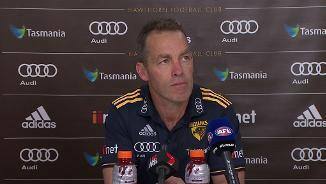 "We did start well and perhaps we didn’t capitalise on some of the opportunities we had early in the game," Hawthorn coach Alastair Clarkson said. 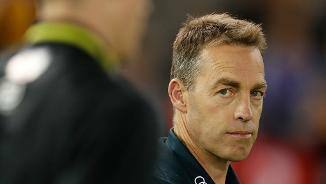 "I think we had five inside 50m marks for the game, which is probably a fair indication that we haven’t gone inside 50m in the manner that we usually like. Brisbane was dynamic when it transitioned the ball, with linking handpasses, overlap run and accurate kicking to an open forward line the hallmark. 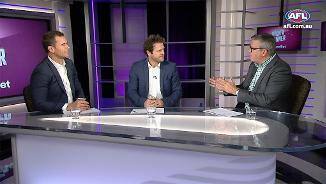 The defining play came midway through the third quarter when McCluggage burst from half-back, handballed to Dan McStay who pulled a clever kick across his body into the path of Jarrod Berry who spotted Cameron all alone in the goalsquare. The lead was then 24 points and Brisbane did not look back. Everything was going their way as the match wore on, with 'The Recruit' Matt Eagles kicking his first career goal in the final term with a checkside from 35m bringing the loudest cheer of the day. Hodge warmed into the game and finished among Brisbane's better players with 19 touches and seven marks, and a big impact in the match-defining third term. The loss is a big one for the Hawks, who drop out of the top eight on percentage. Tom Mitchell had a mountain of ball, finishing with 46 disposals, but after his 16-touch first quarter, didn't have the same influence for the remainder of the game. 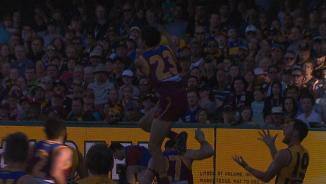 Brisbane Lions: Another clean sheet for the Lions with no niggles in the win. Hawthorn: The major concern for the Hawks was young midfielder James Cousins, who was taken off in the third quarter with a head injury. Cousins collided with the shoulder of Matt Eagles while trying to tackle the Lions big man and did not return to the field. 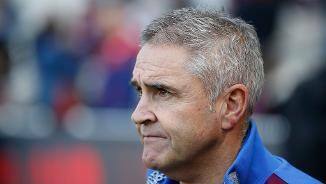 Brisbane faces a difficult task in gunning for back-to-back wins, hosting Sydney at the Gabba next Saturday afternoon. Hawthorn has lost two on the trot and takes on ladder leaders West Coast – fresh off its win over reigning premier Richmond – at Etihad Stadium next Sunday afternoon.